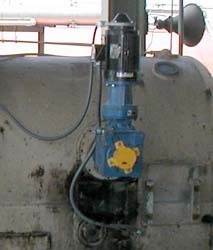 Many older generation coal feeders in service today have outdated equipment such as eddy current clutches, SCRs, controls, gearbox drives, etc. These obsolete systems cause unnecessary maintenance and performance problems. MERRICK offers modern technology and replacement solutions to provide more reliable and efficient coal feeder operation. Improve the weigh suspension for mechanical or previous generation electronic coal feeders. Eliminate levers, linkages, and other parts that can wear causing maintenance and accuracy problems. Convert a chain drive system to a direct drive system. Replace a leaking gear box. Advance from a DC/SCR drive or an AC/Eddy current clutch drive to an AC/VFD drive system. Progress from older electronics to the modern MERRICK Genetix process controller. Avoid parts obsolescence while improving reliability, connectivity options, and ease of use. Replace obsolete clean out drive systems. MERRICK’s Genetix process controller. Benefits include its user-interface and the graphical LCD touch-screen display making the Genetix process controller the easiest controller to learn and use. Also, the Genetix process controller has unparalleled connectivity to most any industrial network protocols. With dual load cells, the Genetix process controller monitors the performance of each load cell independently and converts to volumetric feeding automatically if ever required. No gearboxes leaking oil posing a safety or maintenance hazard.